Omega is without a doubt one of the most recognizable luxury watch brands in the world. With over 13 celebrity ambassadors their timepieces gain constant exposure. On 16th May the brand held an exclusive event in Shanghai to showcase their brand new Seamaster Aqua Terra and express their support for Orbis International – an organization dedicated to providing eye care to the poor. In true Omega fashion, the brand certainly didn’t skimp on the proceedings and set up a “Le Jardin Secret” dinner party for their guests. The venue itself was just as extravagant and innovative as their watches with a transparent roof which provided stunning views of the night sky. Of course the theme of the evening was the watch itself and much of the décor reflected the watch dials of the new Seamaster Aqua Terra watches. 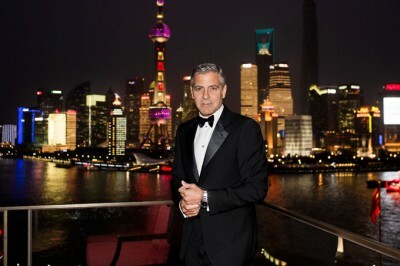 The guest list for the event included long-time ambassador George Clooney, who has been a fan of the brand every since an Omega watch was taken up to the moon on Apollo 11; company president Stephen Urquart; and Orbis International CEO Jenny Houihan. Other local celebrities were also in attendance to both express their love for Omega and support a good cause. The event started with a welcome speech from Urquhart, which was followed by another speech by George Clooney, who expressed his admiration for the Orbis cause. The party concluded with a performance by French singer France Owlle. The Omeg Seamaster Aqua Terra is a classic timepiece that pays homage to Omega’s maritime heritage. It’s instantly recognizable with its decorated dial in a teak concept pattern which gives it the same visual texture of a wooden deck sailboat. The device has 30 minute and 12 hour recorders, as well as a seconds dial which is found in the 3, 6 and 9 o’clock positions. In addition, a scratch-resistant sapphire crystal protects the dial and the bezel is mounted on a 44mm stainless steel case and bracelet. The chronometer is powered by a Co-Axial calibre 3313 and can be viewed through the transparent case at the back. The Omega brand was founded in Switzerland in 1848 and has a rich history; In 1917 Omega watches were the official timepiece for Britain’s Royal Flying Corps, as with the American army in 1918; they were chosen by NASA to be the first watch on the moon; and have been featured in countless movies. The Omega brand is currently owned by The Swatch Group. Omega sponsors many celebrities including Daniel Craig, Peirce Brosnan and Rory Mcllroy. In conjunction with these celebrity sponsorships, Omega support their favoured charitable causes by donating a select amount of their profits. Events hosted by Omega such as the recent Le Jardin Secret dinner party are often used as a platform to raise awareness and encourage donations to charitable causes. Images courtesy of Omega Watches.